Despite the best efforts of keepers, pet lizards occasionally escape their cages and run freely through the house. Recapturing your pet is simplest if you know where he is -- but lizards often escape when no one is looking, thereby allowing them to duck out of sight. Confining the escapee to a known area and searching for clues that will reveal his location will help you return your pet to his home relatively quickly. Consider the habits and preferences characteristic of your pet's species to help guide your search efforts. Capture soft-skinned species in a plastic cup to avoid harming their skin. When you do not know where your lizard is, your first goal should be to prevent him from moving to another location. Most escaped reptiles stay relatively close to their cages, so begin by sealing off the room that houses the cage. Keep the doors and windows closed, block all air vents and shove towels under interior doors to prevent him from slipping underneath. Remove any items from the room that may be harmful to your lizard, such as rodent traps. Do not allow any pets or unattended children to enter the room until the lizard has been captured. When a lizard escapes, he cares little about the trail of evidence left in his wake. Look for disturbed items that may indicate the direction in which he traveled. You can also look -- or sniff around -- for droppings. If you cannot find the lizard, sprinkle a number of talcum-powder or flour "traps" around the house. When your lizard crosses one of the barriers, you are likely to find tiny white footprints that give away his location. While trying to find your lizard, consider the typical behavior of the species. Strongly arboreal species, such as chameleons and iguanas, are likely to head for high ground; look for them on top of furniture or clinging to drapes. Secretive species, such as leopard geckos or monitor lizards, will often hide in dark crevices. Bearded dragons (Pogona vitticeps), are among the easiest types of lizards to capture, as they may perch on couches or tables to survey the land. Always strive to keep your lizard contained in your house, if he escapes the home, your chances of catching him drop precipitously. Small lizards can hide in innumerable places, while larger lizards may be so fleet-footed that catching them is difficult even if you know where they are. In all cases, make it a priority to keep your eyes on the lizard, and try to enlist the help of others who may be able to help you corral the creature. Be sure that your attempts to capture your lizard do not cause your lizard to suffer. While you may have to chase your pet to capture him, try to do so as calmly as possible to avoid causing undue stress. Use a gentle touch once you get close enough to grab him, and avoid grabbing him by the limbs or tail. Refrain from using adhesive traps to capture your lizard, as the strong glue may damage your pet's skin. What Do Wild Geckos Eat? 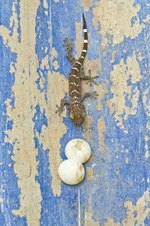 What Do Baby Geckos Eat?